What the heck is a Wave Petunia? There has been a lot of confusion in the past decade about exactly what a Wave Petunia is… It’s become a designation that is sometimes misused, so for all you petunia lovers out there, I would like to set the record straight. About fifteen years ago, a new category of petunias began to be available. These petunias grew to be HUGE! and bloomed a whole lot longer than the petunias with which we had all grown up. Some made temporary hedges, like Tidal Wave Silver, which should be sold with a complementary machete. When I started out as a professional grower in my own nursery in 1976, there were three principle kinds of petunias available. 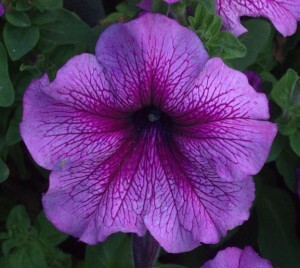 Grandifloras were the most common – “big flowered” petunias that came in a variety of colors and variegation patterns. There were also “Multifloras” – sturdy petunias with somewhat smaller flowers and better weather resistance. And there were also Double Grandiflora and Double Multiflora types – floofy, pretty double flowers. They were hand pollinated in production, and their seed was considerably more expensive than was the seed of the grandifloras and multifloras. We used to raise the grandiflora series like Cascade, Magic, and Ultra. Sugar Daddy is my personal all-time favorite grandiflora, and I still raise lots of it. I always raised a few of the doubles, partly because I like them so much myself in the right setting. They lack the vigor of the Grandifloras but the flowers can be spectacular. We still raise Sonata, a pure white double, in our summer gallon program. Here’s Sugar Daddy…. The Multifloras were always more common in the east and midwest, and their weather resistance was cited as the reason. As you experienced northwest gardeners know, we sometimes get a couple of nice days of rain in early August, which refreshes everything but totally devastates petunias -it pounds the buds and flowers right off them, and flattens the plants, and unless they are cut back hard and fertilized they are toast. If you are willing to cut them back and give them a good feed, they will give you another 2 months of color – or be beautiful until the next major rainfall event. But the new petunias that came into the market about fifteen years ago just grew like crazy all summer long, and hardly noticed a summer rainstorm. I don’t who named them, but I thought of them all as Super-Tunias. 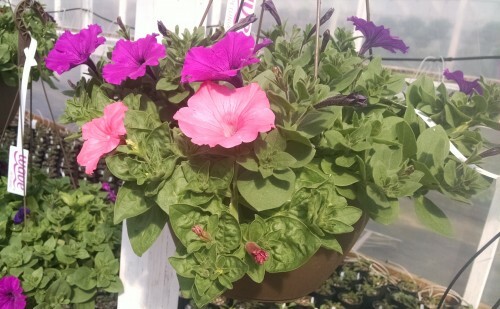 Some of the first of these petunias were a seed-grown variety that were called Waves. They were one of the first horticultural crops to be “branded” like other merchandise, and have been extensively promoted with “POP” – point of purchase banners, showcards, and other wearisome publicity trash, some of which is visible on the baskets below. They actually tried to get all of us to only grow them in extremely overpriced pink plastic pots, but that didn’t last long, fortunately. The first Waves I ever grew went to a landscaper, who planted them in a 24″ tall cement planter that was 48″ in diameter. 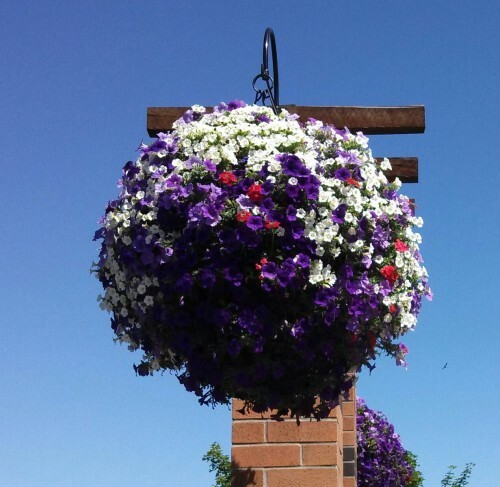 The petunias covered the top, and grew down the sides of the planter, and then fanned out around the planter created a 10′ diameter bizarre floral object, bright purple. Purple Wave had arrived! It’s still the best one…. That particular landscaper overfeeds a bit, and was well rewarded for his extra nitrogen. I still raise thousands of Waves for him each year. Here’s what a Wave basket looks like March 30 in the nursery…. So – what about all those other kinds of petunias, like the Surfinias and the Patios and the Sweetunias? These are really much like the Waves – the result of much experimental plant breeding – but instead of releasing these petunias to the public as seed crops, the breeders have elected to sell the cuttings from stock plants they maintain and license to specialist growers all over the world, particularly in regions all over the world with good natural light and cheap labor. With international air freight, we can have the cuttings with 24 hours. They are produced in clean-room like settings, and technicians with full tyvek suits and booties take the cuttings under sanitation protocols to protect the patented strains from disease organisms. Brave new world! Seed of Wave Petunias costs about 100 times as much as does the seed of a standard Grandiflora variety, and the vegetatively propagated premium petunias such as the Surfinias cost even more. Some of the best and newest varieties are only available as liners – rooted plants – making them even more expensive than the tiny unrooted cuttings which licensed growers can purchase. But they are worth it! 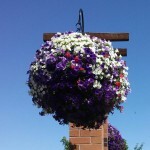 Here’s a basket we grew for the City of Cornelius a few years ago. It features blue and lavender Surfinia petunias, vegetative red verbena, and some other stuff that was choked out by the petunias about the time it was hung up. My favorite plant in this basket is the tiny white petunia. That’s right, it’s a Littletunia, another spectacular performer from those plant breeders. It’s not a calibrachoa – that’s a topic for a different blog post. Soooo….. a Wave petunia is a just seed-grown Super-Tunia as far as I am concerned…..